This is a light and moist lemony cake with a hint of strawberry. Do be liberal with the greasing and dusting of the Bundt pan as the strawberry may stick to it when unmoulding. Great cake to go with tea or coffee! Heat berries in a pot to release juice. Add in 2 oz granulated sugar, cook over medium heat till juicy and moisture reduces to a little under 1/2 cup. Let cool completely. Sift flour with baking powder and salt, set aside. Cream butter and sugar till light and creamy. Add in eggs one at a time, mix well. Fold in sifted flour alternatively with milk, starting with flour and ending with flour. Add in lemon zest. Mix well scraping from the bottom and sides of the mixing bowl. Scoop 2/3 batter into the well greased and floured 10 cup Bundt pan. Spoon the strawberry mixture in a ring around the middle of the batter, not touching the pan. Top with remaining batter and smooth evenly. Bake @ 180 deg C in a preheated oven for 55 to 60 mins. or till golden brown. Test with a skewer till it comes out clean. Remove from oven. Poke holes on the cake and lightly pour the syrup onto the cake. Let cool in pan before unmoulding the cake and letting it cool completely on a wire rack. 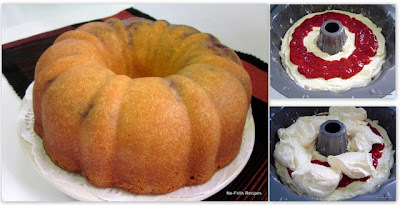 The word 'bundt' always catch me to stop by to the blog....and here I am visiting looking at your beautiful delicious lemon strawberry cake. It look so moist in texture. This is the kind of cake I like to indulge in. Yes, this cake tastes good with a tinge of lemon and strawberry. Lemon and strawberry sounds like a very nice combination... your cake looks so fluffy and moist. It's a good combination and thank you. I love the crumbs and that layer of strawberry jam? This kind of light cake can induldge without feeling guilty! Well, it's not bottled jam, just cooked fresh strawberries with sugar till thick. Hi! Thanks for visiting my blog and leaving a comment! I'm glad I found your blog. This cake is so beautiful! Have a great day! You're welcome and you enjoy your day too! I love the shape of bundt cakes. Your cake does look moist and lovely. I like the combination of lemon and strawberry. Yes, I've a soft spot for bundt cakes, just like their shapes. Give it a try. You'll like the combination! I love how you baked your bundt cake into such nice golden brown color and the texture is moist and fine!! Thank you. I think it's a good idea to invest in a bundt pan. Think about it! what is caster sugar ????? Caster sugar is very fine sugar for baking. Available in supermarkets.